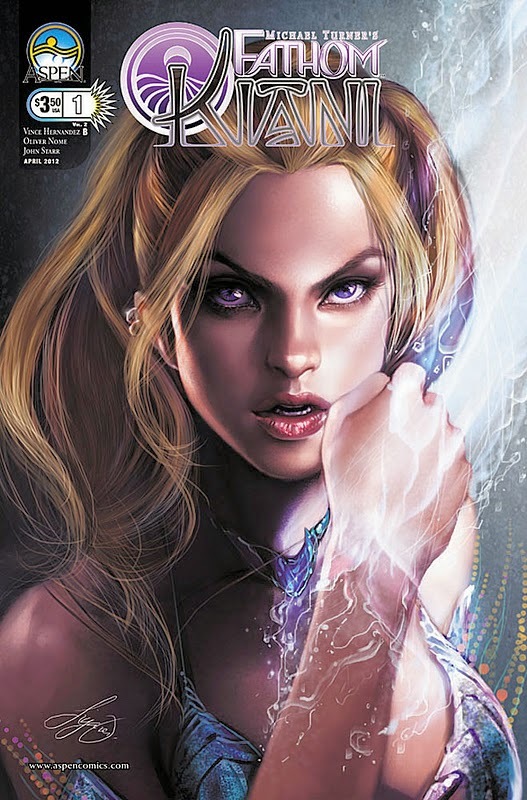 We have been big fans of Aspen Comics ever since the creator Michael Turner decided to create the company. We have seen many terrific series created by the Aspen Team from Soulfire, Fathom, Lady Mechanika, Charismagic and other series. In these series, we have seen many original stories. 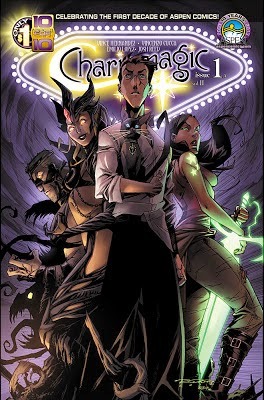 One of the creators from Aspen Comics is Vince Hernandez. We have been following his works from his creating Charismagic to writing Fathom to Executive Assistant. Vince Hernandez has recently created a new series, Damsels in Excess, which will be in stores this July. 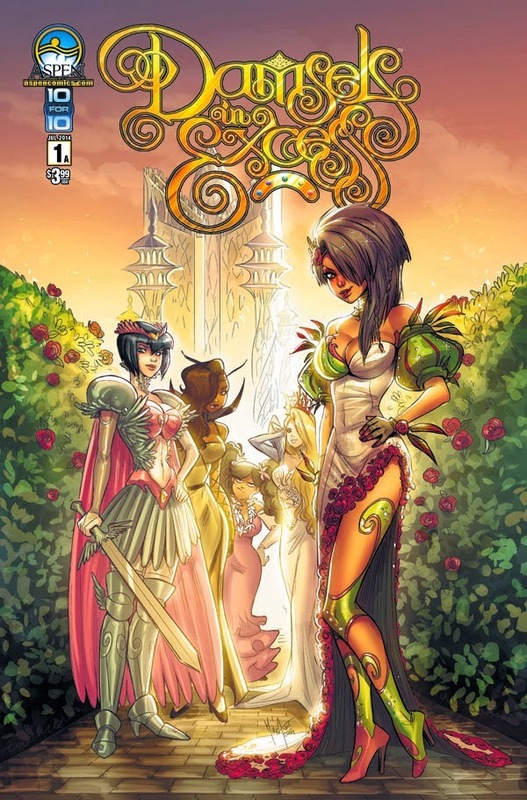 Free Comic Book Day is this Saturday and Aspen Comics fans are in for a treat with World of Aspen 2014 being released with Damsels in Excess #0. While we were at WonderCon a couple of weekends ago, we talked with Vince Hernandez and asked if we could chat with him about his new series, Damsels in Excess. 1) We just want to thank you Vince for this interview opportunity. We know you are quite busy and you amaze us in how many hats you do wear at Aspen Comics. You are the Editor in Chief and also continue to write many series. You have created one of our favorite series Charismagic. We actually had to look back at our interview we did with you on Charismagic. You are currently getting ready to release another series you have created, Damsels in Excess. Can you tell us a little bit about the story? Absolutely. As you can tell from the title, our story heavily involves a host of female characters, and as readers will come to discover: The title “Damsels in Excess” can also be taken in a literal fashion as well. But, I’ll save that for the readers to experience. The plot involves a quintet of princesses that govern a fairy tale land known as The Five Realms. Each of these realms is a different kingdom yet they are connected through their shared history and common laws. These ladies known as “The Five” are in essence rock stars of their own lands. I’ve written this story as what I like to call a “contemporary fairy tale,” and with that in mind I tried to mirror these characters to what a modern day princess is today, or better yet, a celebrity. But, of course, with elements like power, wealth and a certain disease plaguing the Five Realms, it’s not all peaches and cream as readers will come to find out. 2) You have created Charismagic, Trish Out of Water, and now Damsels in Excess. Where do you come up with your creativity in making new original stories? I’m blessed to be in a position where I’m allowed a great amount of creative freedom in everything I write at Aspen. Frank [Mastromauro] and Peter [Steigerwald], our co-owners, have entrusted me with not only coming up with my own ideas but also storylines for some of our cornerstone characters. With that level of commitment to what I can offer, it’s easy to step up to the plate and put my full amount of time and energy into these worlds. I think any writer worth their salt will constantly be creating these new concepts and plots in their mind, it’s just a matter of applying those thoughts into tangible work on a regular basis. I like to think I’ve been able to develop a healthy approach to this. One of the most important parts of my writing process is understanding where I need to focus my energy at any given moment, and save my new ideas for when I can provide the necessary commitment to fleshing them out. It’s a process. 3) Is Damsels in Excess a mini series or ongoing series? It’s written in chapters, so the first story arc will be five issues then we’ll hopefully release the next chapter if the reception warrants it. Once you delve into the world of Damsels, I think you’ll discover that we created a massive world of possibilities that I hope to explore. Like all projects, however, it’s up to the fans to dictate what they want to see—and I hope it’s more Damsels! 4) Are you working on any other projects at this time? I presently just wrapped up the third volume of Fathom: Kiani and have turned my attention to the mid to later issues of Damsels. After that, I have a few new items on the burner that have yet to be announced but are new and exciting, so I hope fans of my work and Aspen in particular will keep supporting what we do because we’re having a blast! It was great chatting with Vince Hernandez once again at WonderCon and learning a bit about your new series Damsels in Excess. 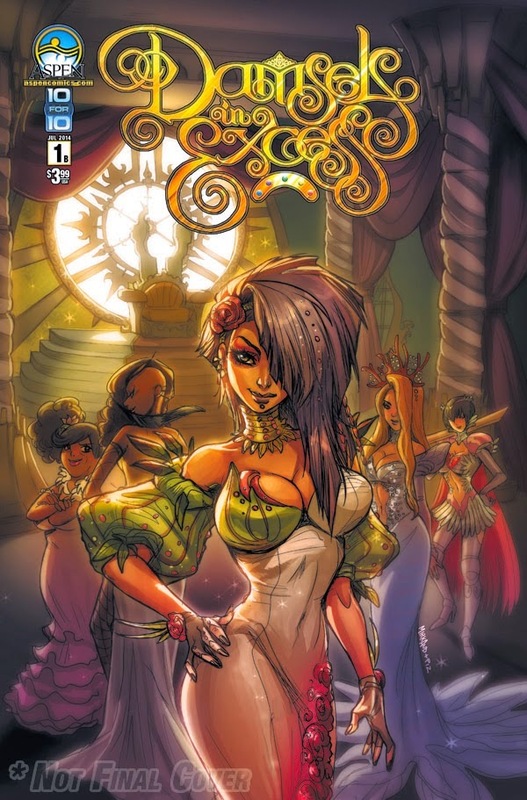 Aspen Comics Damsels in Excess #1 will be in stores this July 23rd. The story is by Vince Hernandez and the art is by Mirka Andolfo. If you want a glimpse of what we have to look forward to in this new series, pay a visit to your local comic shop this Saturday during Free Comic Book Day and pick up World of Aspen 2014 and read Damsels in Excess #0.